You could bag an $8,000 trip to the Caribbean on top of your prize money in the Dusk Till Dawn Grand Prix! Final Table the Dusk Till Dawn Grand Prix with a Golden Chip in play to earn the $8,000 Caribbean Poker Party Package. The only way to win a Golden Chip is to win it in one of our Dusk Till Dawn Grand Prix Golden Chip Satellites on partypoker. You will find them in the Grand Prix Poker Tour and Main Tour tabs. We have 5 x Golden Chips guaranteed at 5pm, 7pm and 9pm nightly. Your Dusk Till Dawn Golden Chip also comes with $109 tournament entry! The dangerman in Day 2 of the £250K Grand Prix at DTD this weekend could be 79 year old, Paul Yong - yes Rob's Dad! He has 185K chips, blinds start at 1k-2k so 87 bigs. Highly unpredictable player! So far we have 1200 entries for this Grand Prix, the GTE is £250K sterling so we need 3333 equivalent entries. 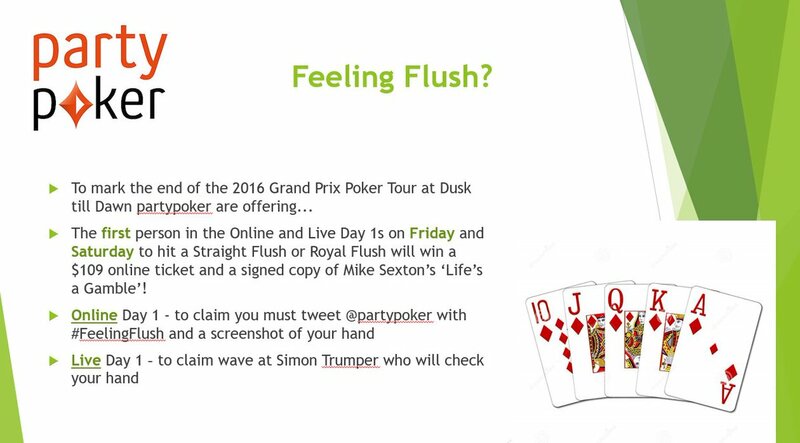 You can buy in at DTD for £75+£10 or play online on partypoker. Remaining Live Day 1s are Fri (5pm and 8pm at DTD) and Sat (1pm 5pm 8pm), there are Online Day 1s Fri and Sat at 7pm and 9pm, that leaves 9 in total. On Day 2 at 12pm the blinds are rolled back to 1k-2k (average 100 bigs) and same as the Grand Prix in Canada - players still have the option to buy into Day 2 for £550 and get a 200k stack. they play 16 x 30 minute levels and come back for day 2 Sunday when the field amalgamates. Going to be a busy weekend! I think that is called a statement beard. I stand poised, this could be an interesting hand….. I wait, and Raja folds the nut flush draw showing the table, hence i can report it. It is like the script from a Pinter play. and shows to win the pot. That’s what comes of playing your favourite hand Mr Harper. You are welcome to ask questions, request chip counts, pictures etc all weekend.